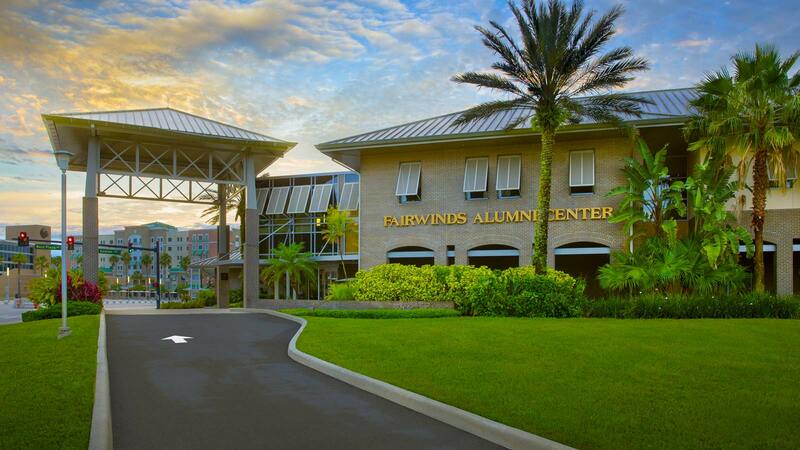 The UCF FAIRWINDS Alumni Center celebrates an important anniversary. The campus home to more than 250,000 alumni, the UCF FAIRWINDS Alumni Center is more than a venue for the Alumni Association’s popular indoor tailgates; it has also accommodated everything from meetings of UCF’s board of trustees to political debates, marriage proposals and wedding receptions. This year, UCF celebrates the 10th anniversary of the building — and the remarkable $1.2 million gift from FAIRWINDS Credit Union that made it possible. FAIRWINDS Credit Union President and CEO Larry Tobin, ’83, was well aware that UCF alumni lacked a home on campus — a front door to knock on when they visited their alma mater. After all, he is one of us, along with nearly all of his executive management team. Since opening in 2005, the UCF FAIRWINDS Alumni Center has become the on-campus home for more than 250,000 alumni when they return to their alma mater. In 2004, after discussions with UCF Alumni Association leaders Tom Messina, ’84, and Manny Rodriguez, ’75, FAIRWINDS committed to support the construction of a state-of-the-art facility near the north end of Memory Mall. With memorabilia displays, ballrooms, a boardroom, a library and offices for Alumni Association staff, the building opened the next year. A decade later, the UCF FAIRWINDS Alumni Center has hosted tens of thousands of alumni for indoor tailgates and other events, provided meeting space for groups ranging from the Student Government Association to the State University System’s Board of Governors, and hosted more than 50 wedding receptions and dozens of bar and bat mitzvahs. In April, President John C. Hitt presented FAIRWINDS Credit Union with the UCF Partnership Award, recognizing not only their partnership in realizing the alumni center but also their long history of support for other university initiatives and priorities, including First Generation Student Scholarships, the Knights Helping Knights Pantry, the UCF Police K-9 fund, Bright House Networks Stadium and the College of Business Hall of Fame.